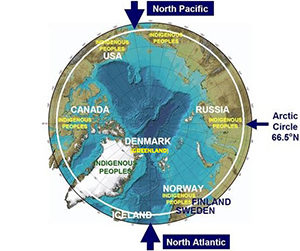 A generalized view of the Arctic Ocean system bounded by the sea floor (Jakobsson et al. 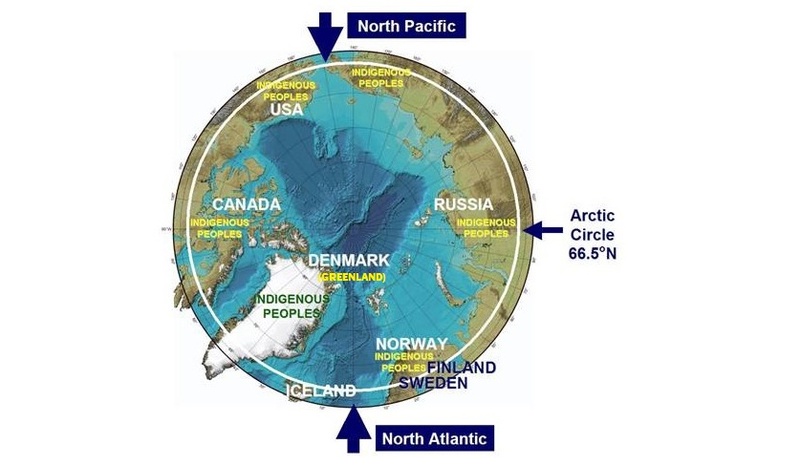 2008), surrounding continents and sea ice on the surface with inflow and outflow from the North Pacific and North Atlantic, directly impacting Arctic marine ecosystems as well as adjacent coastal states (white), non-coastal states (blue) and circumpolar indigenous peoples (yellow) north of the Arctic Circle at 66.5 degrees North latitude (white circle), which is an unambiguous astronomical boundary to delimit the Arctic Ocean. From (Berkman 2010).